"Draaideurcrimineel" is composed of "draaideur" and "crimineel", which translate to "revolving door" and "criminal" respectively. "Draaideurcrimineel" is an informal synonym of "recidivist"
Alternative synonym is "veelpleger" (lit. : many-committer). – "Draaideurcriminelen hebben vaak ook een zedendelict gepleegd." – "Geloof je dat echt?" – "Rechtbanken zijn overbelast door de enorme hoeveelheid draaideurcriminelen." – "<Boze winkelier> Ik ben dit jaar al vier keer beroofd! Het zijn allemaal draaideurcriminelen! Oprotten moeten ze!!" – "Door één deur kunnen (met)": (lit. : to fit through one door) to get along (with). – "Dat doet de deur dicht! ": that does it! – "Mijn auto is nu voor de derde keer bekrast…dat doet de deur dicht!" – Crimineel: criminal [noun] [de crimineel, de criminelen]. – Deur: door [noun] [de deur, de deuren]. – Draaien: to turn, to spin [verb] [draaien, draaide, h./i. gedraaid]. – "Mijn hoofd draait, ik geloof dat ik een misselijk wordt…"
– Veelpleger: (lit. : many-committer) recidivist [noun] [de veelpleger, de veelplegers]. 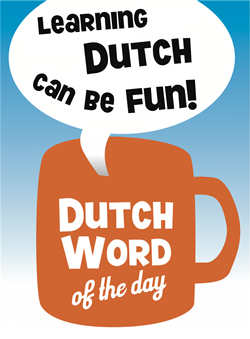 This entry was posted in Dutch word of the day, DWOTD 1.0, Vocabulary Guru and tagged crimineel, deur. draaien, draaideurcrimineel, recidivist, veelpleger by Marc. Bookmark the permalink. I’m a big fan of DWOTD, but it’s not often I get to expand my English vocabulary here, too! ‘Recidivist’? I think we’re more likely to say ‘repeat offender’. Appearently the Dutch like this term. At my university in the South of the Netherlands it is used to refer to exam repeaters (which really puzzled me at first). I love these compound nouns that are such a feature of Dutch (and German I believe). In English we don’t really have this so much. Our own “toothpaste” and “underground” pale into insignificance when compared with the glorious “bestuurdersaansprakelijkheidsverzekering” or “Kindercarnavalsoptochtvoorbereidingswerkzaamheden”! LOL @ recidivists. Rebecca is right, very few native English speakers know/use this word. The angry shopkeeper certainly would not. It is used mostly in formal contexts, e.g., studies, law enforcement discussions, etc. The everyday person doesn’t use it. Thanks guys for your comments, I’ve made ‘repeat offender’ the first translation. Reminds me of that old story about the British diplomat and his translator listening to one of Bismarck’s speeches. Two minutes after the start of the speech the diplomat asks his colleague, who has been sitting in silence, “Why aren’t you translating the Chancellor’s speech?”.